The Red Cube is nothing. I invented The Red Cube. However, The Red Cube is everything. The Red Cube is the essence. The Red Cube gives your essence. Because there is always a driving force in our lives, something that moves us; a man, a woman, a career, money, love, hate, religion, ourselves. It doesn’t matter what The Red Cube is, what matters is the relationship oneself has with it. Red Cube… The Red Cube is a mask. A mask that defines the meaning of someone’s being and its nature. The Red Cube is open to be filled with content. Throughout the Red Cube series Osman is examining existence on a universal scale focusing in on the general anxieties of a human being and the essences of personality. The Red Cube appears in the works in relation to the figures it relates too, in some it dances in harmony in others it jars and obstructs, it serves as a conceptual pinpoint, an anchor for the work and it is sometimes interrupted by the Black Cube. 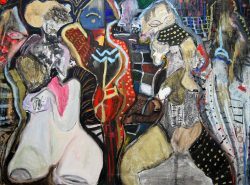 Osman’s paintings are in narrative to each other, each painting responding to another in the same manner the figures within them relate. With clear reference to Gustav Klimt and Piet Mondrian using closely related signifiers, she searches for a universal thread with which to connect or understand, at the same time as seeking an inner possibly shared logic. 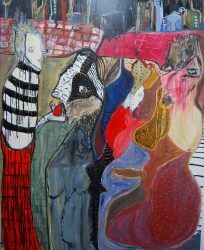 The paintings demonstrate the struggle to identify or anchor oneself in relation to others, their personas, their anxieties, their feelings or their ways of being, they move through to an investigation of the artists’ relationship to existence itself, a search for self in the larger context of the universe. However you read Osman’s work whether seduced by the aesthetic beauty of her rich palette or the depiction of conflicted pain, they remain tirelessly fascinating. Just when you think your eye has settled and is ready to move on, something small jumps out to bite you and you are compelled to start all over. As with the nature of relationship to ourselves, each other and universe, we seek to understand yet we perpetually fail, the grappling with this journey is where the success lies in these fascinating and compelling works of art. 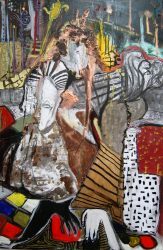 Mona Osman was born in Budapest, Hungary in 1992, her mother is a Hungarian Jew and her father a Sudanese Muslim, this cultural diversity has always influenced her work. She spent her childhood in Budapest, later in Nice, in France and finished high school in London. She graduated in 2014, with a BA Fine Art at Goldsmiths University of London after being awarded the Neville Burston Painter’s award and the Goldsmiths Warden’s Purchase Award. She is currently completing her master degree in Painting at the Royal College of Art. 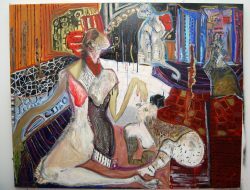 She has exhibited in C&C Gallery London, London Art Fair, GX Gallery London, various other exhibitions nationwide and has works in private collections throughout the UK.